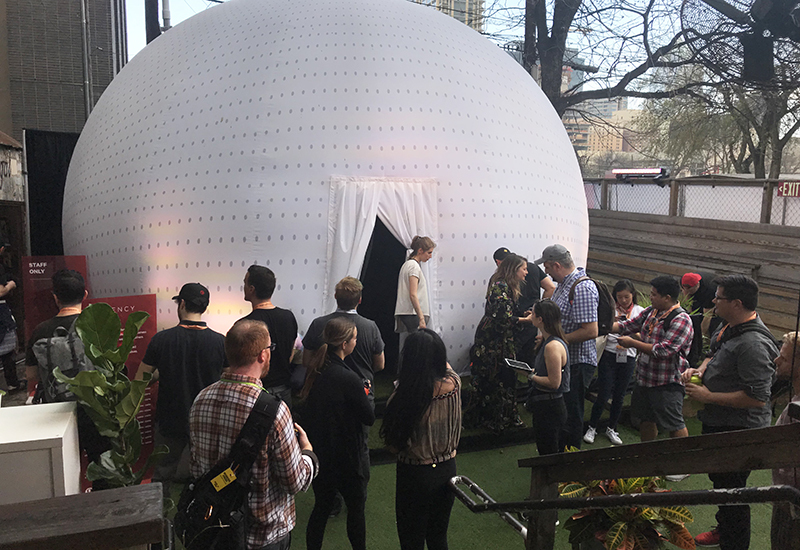 If ever there were an event that lets brands flex some strategic muscle, it’s SXSW. The annual Austin-based conference and festivals, this year March 8-17, attracts influential and savvy audiences that hail from the film, emerging tech and music industries. 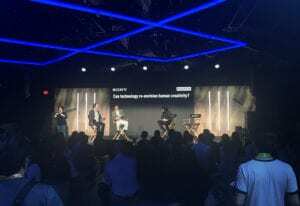 Engaging this crowd is a tall order for brands, some of whom forgo traditional activations and sprint toward immersive, off-site experiences, like 2018’s SXSWestworld, HBO’s experiential takeover of a real-life ghost town 20 minutes outside Austin. 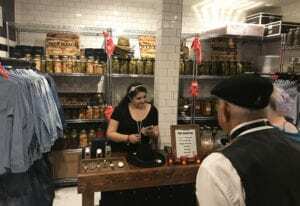 Attendees could cash in points at the on-site General Store. We headed to the bar to choose from a pair of themed cocktails, “The Ambush” and “Clyde’s Demise,” where we learned from the bartender that completing each activity in the speakeasy would earn us points to spend in the “General Store,” a small shop selling swag like Jack Mason watches, Stetson hats, Wrangler denim shirts, flasks, patches, Netflix-branded bandanas and pins. In one corner were two tables for gambling, offering Texas Hold ‘Em and Blackjack, which earned attendees 50 points each. (Points were gifted to players through the touch of the RFID bracelet, just for playing.) Naturally, we were promised more for a winning hand. In another corner, attendees posed for black-and-white “The Highwaymen”-branded “wanted” posters for a 100-point bounty. 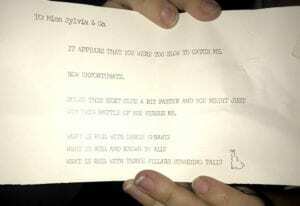 Various riddles handed out to attendees offered clues. Meanwhile, the activation’s center of commerce, the General Store, was abuzz with activity. The Stetson hats were a big hit with the gents. The easy 100 points we accrued from the photo op was enough to buy a pin, but with a little sweet talking we scored swag from the next level up, a red Netflix bandana. We noticed one attendee cashing in enough points to take home a sweet Wrangler shirt. How’d he and his date rack up so many points? “We found out someone was going to rob the place. It was an inside job.” And a job well done at that (Agency: Collide). Sony’s sprawling Wow Studio footprint, which occupied the corner of Trinity and Cesar Chavez streets, presented a series of installations that contemplated technology’s relationship to creativity. 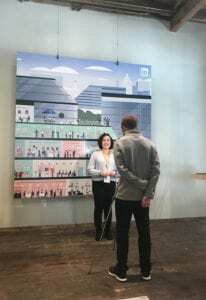 At every turn, beginning with giant posters on either side of the entrance and murals on the warehouse’s exterior along Cesar Chavez, attendees encountered the question, “Will technology enrich human creativity?” Each experience touched on the theme. 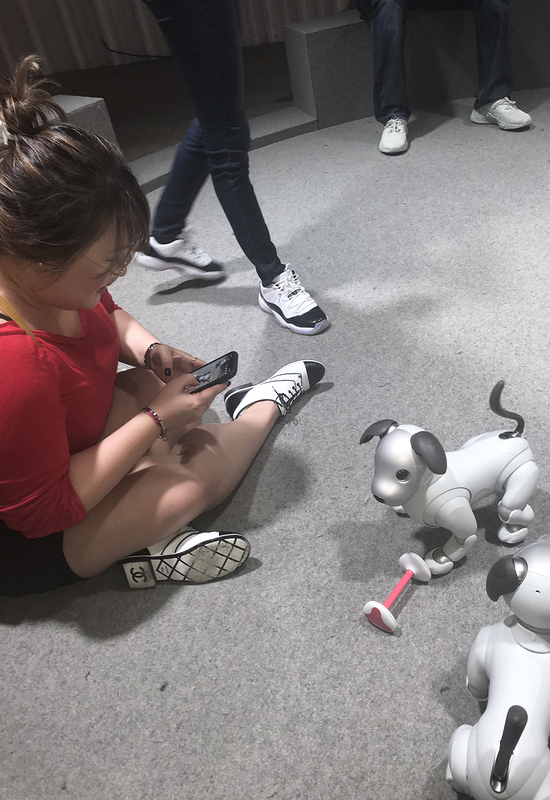 After scanning a badge and receiving two tokens for free drinks, our first stop was an Aibo playpen populated with Sony’s latest iteration of its adorable robotic dog. With lifelike movements, the ability to recognize up to 100 human faces and the capacity to develop a unique personality through human interaction, it’s safe to say that artificial intelligence used this way is the opposite of terrifying. It was hard to tear ourselves away from those cuties, and we weren’t alone in the sentiment. Next up was a “tribe” of small robots that looked like mini Johnny 5’s from the movie “Short Circuit.” Only these guys hadn’t been struck by lightning, and they were communicating with each other about us rather than to us. Conceived by Michael Spranger and Stéphane Noël, and with AI programming developed by Sony Computer Science Laboratories Inc. (CSL), the Das Fremde project—which translates to “stranger” from German—was defined as an AI robot installation that serves as a form of communication art. 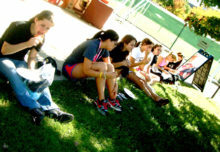 As attendees watched the robots, the machines emitted chirps and whistles while studying us, effectively communicating observations to each other in their own, continually evolving language. While we gazed in wonderment, one bot woke up from a slumber, made a few noises at us, reported to the others, and then experienced a system overload and went back to sleep. We’re with you, Johnny 5. Before rounding the corner to the studio’s main attractions, we checked out a handy, digital map on the wall that helped to orient attendees. It also recommended visiting the experiences in a particular order. A brand ambassador suggested we download the Sony events app, available through a QR code located on the map, which unlocked giveaways like a shirt, beanie, hat or tote bag after attendees completed a survey. 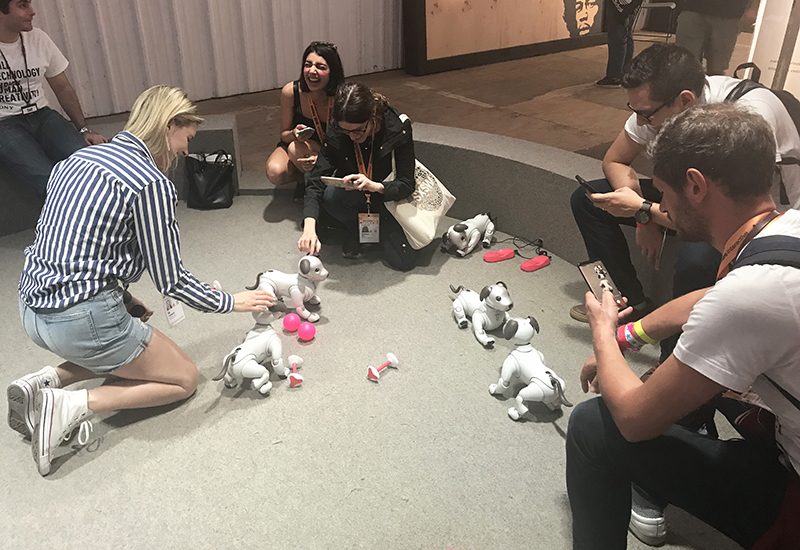 Sony’s latest iteration of its robotic dog was a big hit with attendees. Beyond the main area was a stage for speaker sessions and programming throughout the activation’s run, as well as a bar with high-top tables made from untreated wood and a giveaway station, where attendees picked up the swag. 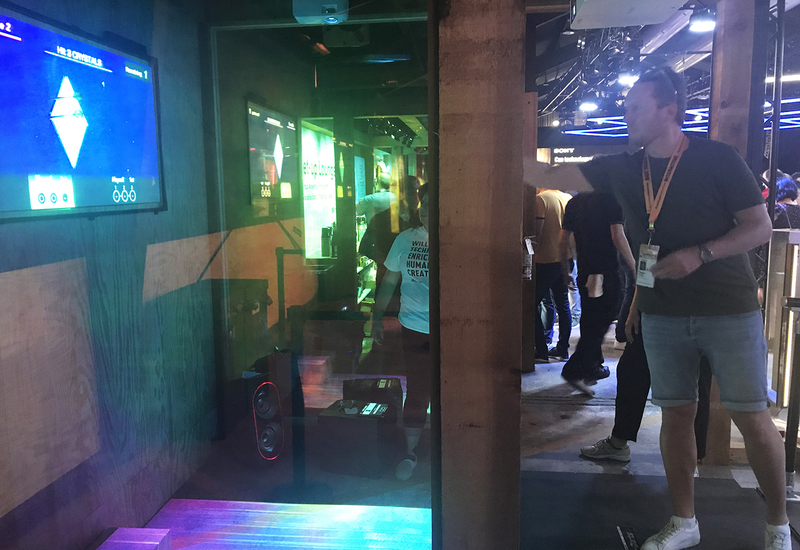 A brand ambassador demoed the Sony product Xperia on one of the tables, a device that projects a touch screen onto a flat surface, allowing consumers to scroll and move graphics with their fingers. To the left of the bar was a game of Flash Darts, where attendees lined up to launch darts at a projection screen in three increasingly difficult rounds while feeling vibrations underfoot created by Sony’s haptics technology. With each hit of the moving target on the video screen, the floor vibrated, and the sensation increased as the rounds progressed. Darts on steroids? We’re in. The final experiences were each housed within a black box installation and required waiting in line for a turn. First up was Flow Machines, a technology developed by Sony CSL that aims to augment human creativity with machine learning and signal processing technology. An exercise in AI-assisted music composition using crowdsourcing, the experience gathered 15-20 attendees at a time in a room to co-create music with one another, and a machine. The software composed a variety of melodies, chords and base lines, and, through a show of hands, attendees chose their favorite portions to include in the composition. Sony’s Superception (super + perception) project returned to SXSW, this year with “Fragment Shadow.” The experience projected outlines of attendees’ shadows onto a wall, incorporating color, abstract shapes and natural scenes, like an undulating ocean surface. And at a photo activation, staffers snapped pics and invited attendees to draw over their own GIFs by finishing the sentence “I am the next…” The collection of GIFs were then projected onto the wall in a mosaic. In what was our favorite experience, we learned about using the principles of inclusive design in “The Cave Without a Light.” Lines were long and slow for this one, but it was worth it. A quartet of attendees at a time were escorted first to a small back room to store bags (and phones) and then were given a pair of Sony headphones to put on. 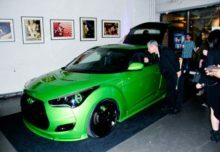 After an intro video about the experience, attendees learned that the exhibition, partially designed by a blind Sony engineer, was meant to be accessible for a diverse group of people, including those who are disabled. As if that weren’t enough, we were then led to a room where four, bright yellow-painted forklift platforms awaited, each featuring a set of bongos. We were told we’d be descending into a dark cave without light that mysteriously existed below the venue, and, once there, we’d compose a music track together in complete darkness. Then the lights went dark, and we “descended” into the cave (platforms gyrating did the trick). Our guide encouraged us to make music however we pleased, and a vocalist joined in to add some extra musicality to our jam session. Rock on. 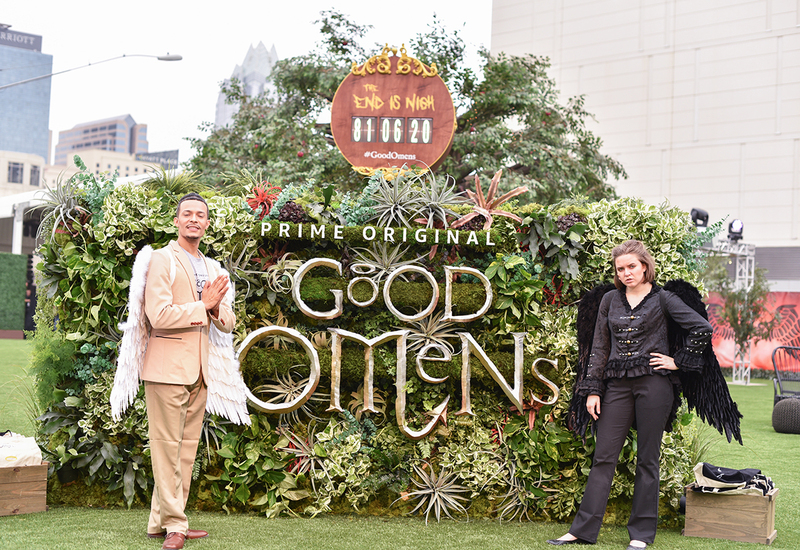 Amazon Prime Video’s activation was inspired by its new apocalyptic-themed series. Amazon Prime Video went big this year. We’re talking huge. Creating a festival within a festival, the content studio’s garden of earthly delights, inspired by its apocalyptic-themed upcoming series based on the book “Good Omens,” offered attendees an array of hedonistic pursuits, from manicures and hand massages to salon sessions to puppy cuddling to beer taps flowing from a 20-foot tree in the center of the footprint. We counted five photos ops, (and that’s not including the photo-worthy moments), three food stations, myriad costumed actors touting, “The end is nigh!” within the footprint (and throughout the entire SXSW festival), sword swallowers, a string trio, a Queen tribute band, and more. 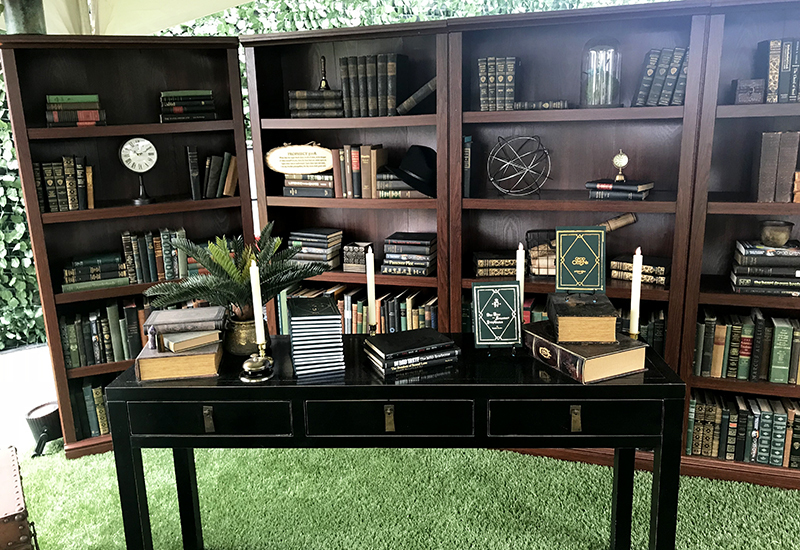 Additional touchpoints included a pop-up library offering surprises hidden in leather-bound books for lucky attendees to discover and a replica of the demon character’s 1926 Bentley automobile. And scale they had. More than 10,000 attendees passed through the activation over its four-day run. The space doubled as a private event venue as well, with additional touchpoints offered, from tattoo artists to aura readers to a giant seesaw. 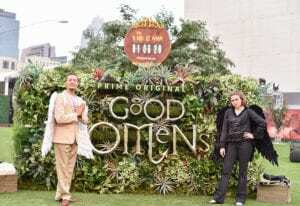 Programming included a talk from “Good Omens” author Neil Gaiman, a cast panel and a portrait studio accessed by top talent. 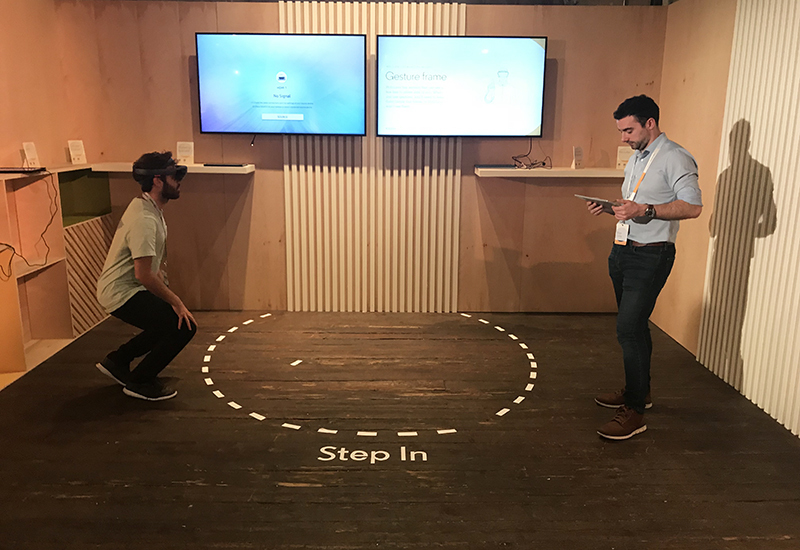 Check out our Instagram stories for video of the activation (Agency: LeadDog Marketing). 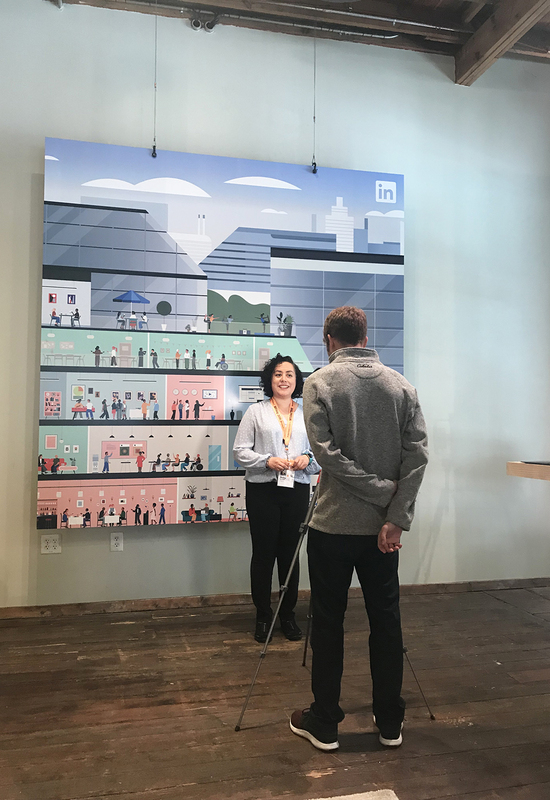 The LinkedIn Studio activation at Brazos Hall was a bustling hub of professional advancement, from online video tips to profile checks to headshots. It wasn’t as playful as some of the other activations, but it didn’t need to be. Attendees entered the space and approached a welcome desk for a lay of the land, which bore the aesthetic of an urban loft. The space featured exposed concrete, beanbag chairs and Tetris-style wooden blocks to chill on. Once inside, we were hit with a flyer for free LinkedIn Learning courses obtained by scanning a QR code. Then we were approached by a LinkedIn staffer who suggested we make our own LinkedIn video to increase engagement on our profiles. With a playful, pastel-colored office scene as a backdrop, attendees recorded video with their phones (which sat on a tripod enveloped in flattering lighting) that were saved or uploaded directly to LinkedIn. Handouts with tips on how to make your video “camera ready” lay on nearby tables. Through a HoloLens display, attendees could see projections of LinkedIn data. 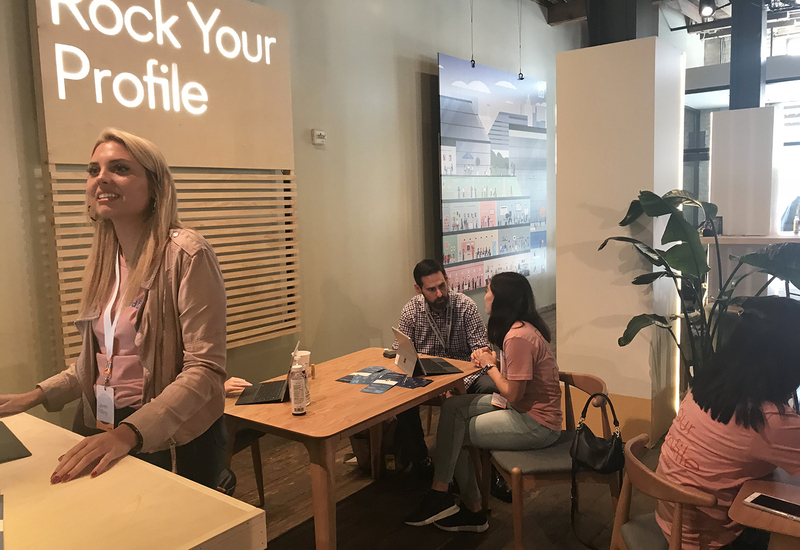 The next logical step was the “Rock Your Profile” station, where LinkedIn reps gave private consultations on improving attendees’ profiles. And just as popular was the next activity: professional headshots. 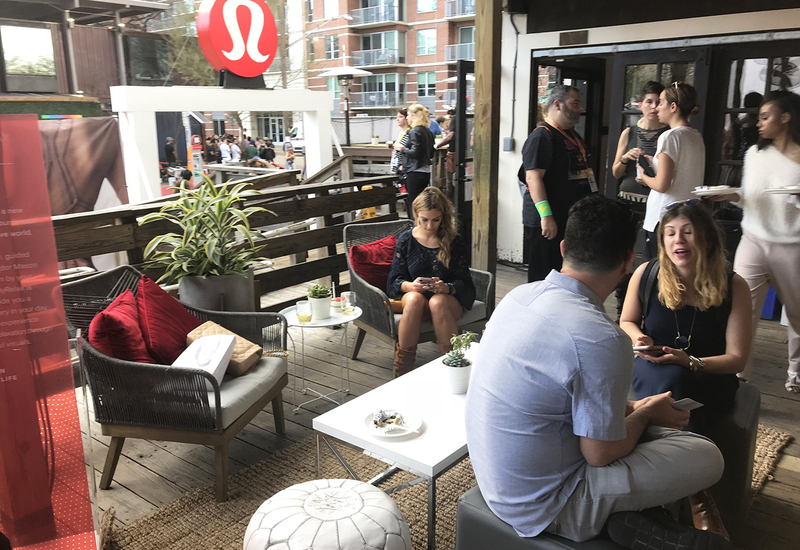 Savvy eventgoers learned through the SXSW app ahead of time that LinkedIn was offering the service, so those who took the brand’s advice to “dress to impress” lined up not just for a great photo, but hair and makeup as well. Nice touch. 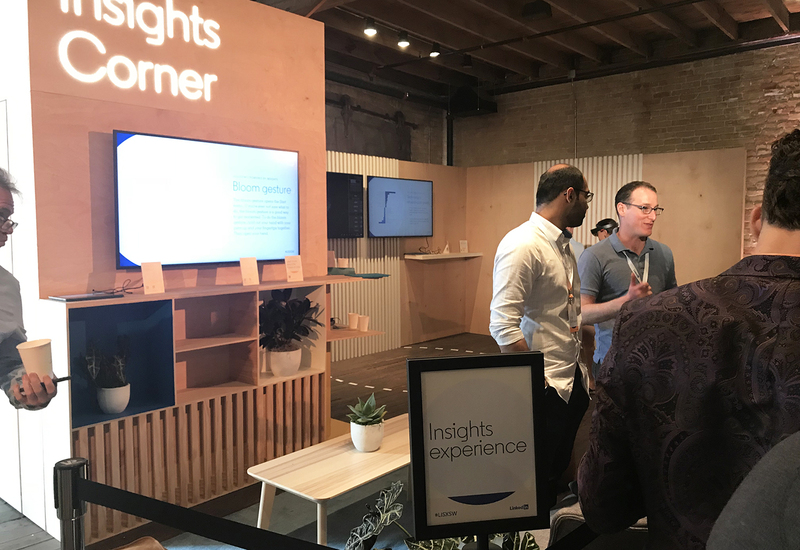 Other touchpoints included a complimentary café serving espresso drinks, matcha, chai and cold-pressed juices, a learning lounge with headphones queued up with LinkedIn lessons, and an “Insights Corner,” where, through a HoloLens display, attendees could see projections of LinkedIn data about the evolution of work and how professions are changing (Agency: Invisible North). 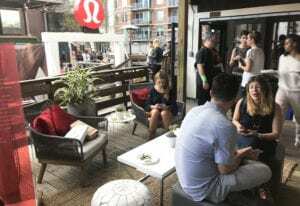 Over at Lululemon’s Sweatlife House, which took over Clive Bar on Rainey St., brand reps in leggings oozed mindfulness from every pore. The athletic apparel brand built a space for attendees to meditate within the chaos of a giant festival—a trend we’re seeing in experiential more and more. 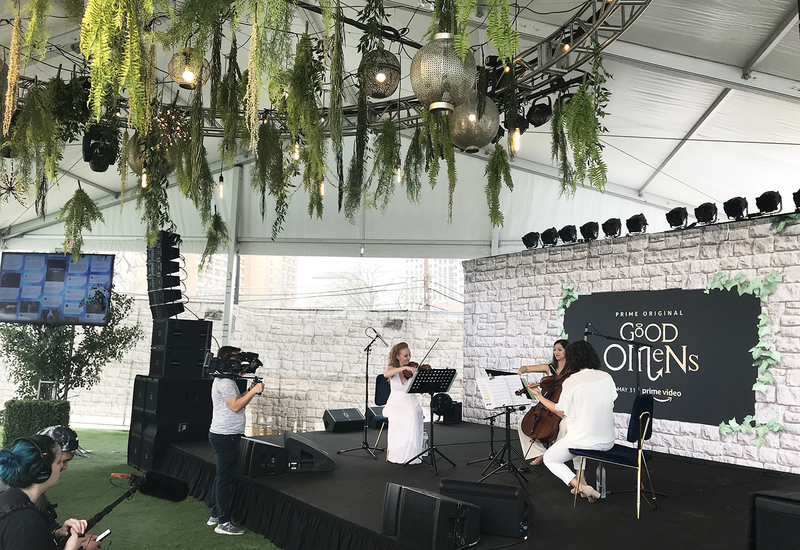 Lululemon partnered with New York City-based Frequency to lead pre-recorded sessions of restorative yoga, sound therapy and meditation inside a large, white wellness dome located in the venue’s outdoor space. Invites went out to select attendees ahead of the fest, but short waiting lists were available for walk-ups. A hydration station and a phone charger—“vinyasa for your phone”—were set up outside of the dome. Another moment of “recovery” at the house was a guided virtual reality experience. While seated within bright, red pods, we sampled a service that is soon to appear in Lululemon retail stores. The guided meditation is unique in that your eyes are open and the visuals are arresting, which makes it a tad more difficult to relax, we discovered. Led by the soothing voice of global ambassador Mason Mashon, the experience adapts to your heartrate, which is monitored with a bracelet. We were guided through a tranquil snowy scene featuring the Northern Lights, whose colors grew more vibrant as we relaxed. A second visual, a crackling campfire, became more dynamic as our heartbeat slowed. We’re not sure we did this one correctly, though, as we learned that our pulse indicated the fire made us “energized.” In any case, it was a welcome timeout from the bustling festival scene. 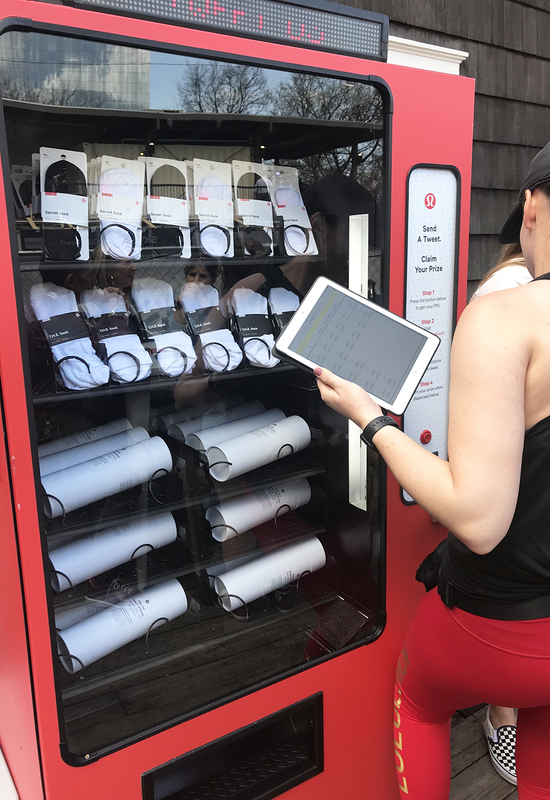 The brand’s outdoor patio featured another popular attraction: the Lululemon vending machine. Attendees queued up for free socks and water bottles, earned by tweeting about Sweatlife House with its hashtag. For International Women’s Day, attendees were asked to write down an action they’d commit to further gender equality and post the card to a wall. Indoors, acai bowls, fajitas and Chameleon cold brew coffee were served.